Texans Incorporated: The Birth of a Lamp Factory. Small towns, in Texas or elsewhere, have have been known to struggle economically. Bangs, Texas was no exception, living quietly in the shadow of Brownwood, its larger, more cosmopolitan, and more prosperous neighbor to the east. But that's not to say that Brownwood was experiencing unbridled growth. Never in danger of being absorbed by the larger community, Bangs was always at arms length. The mechanics behind this status-quo is beyond my scope of knowledge, but Brown County was clearly not going to evolve into the sort of mega-plex of intertwined suburbs found in Tarrant/Dallas or Harris Counties. Bangs stood alone, and five local businessmen weren't content to see their town languish in the hardships that had befallen it. Survival was dependent on action, and a far-reaching plan was conceived in May of 1951. The authors of this proposition were key figures in Bangs: T.M. "Tommy" Young, a druggist, Thomas Levisay, a local grocer, Oren Bauer, hardware merchant, Raymond Morgan, banker, and Forrest Kyle, publisher of the Brown County Gazette. Described as a one-man chamber of commerce, it was Forrest Kyle who presented the idea of lamp manufacture. Mr. Kyle's brother in Dallas had done business with the owner of a lamp factory in Mayfield, Kentucky, and all indications were that it was a highly profitable enterprise. 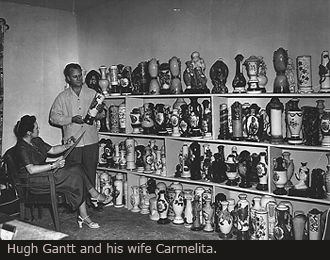 Texas-born Hugh H. Gantt had founded the Polynesian Arts Company in Mayfield just after the war, converting a tomato cannery into a modest facility for pottery manufacture. Located in Graves County, Mayfield was an ideal location for pottery production, as the area was known as an enormous resource of ball clay. Starting with seven employees and a single kiln with a 200 unit per day capacity, the company soon grew to what was said to be the largest producer of lamp bases in the world. Polynesian Arts also produced a line of Hawaiian-styled ware called Tropicana that was highly regarded for its detailed, colorful designs. Given their 150 employees and a monthly output of 90,000 lamps, Polynesian Arts was clearly an attractive business model, and one that warranted a closer look. It was decided that Forrest Kyle, Tommy Young and Raymond Morgan would drive to Mayfield, survey their operation and report back to the others. Gantt proved quite hospitable and happy to provide a grand tour of the facility, fully detailing the process of high-volume pottery production. Most concerns regarding the viability of such an operation were soon erased, and a favorable report was shared with the group in Bangs. Given the profitability of the Mayfield plant and the cooperation displayed by Gantt, the notion of a lamp factory in Bangs was determined to be a smart move, and talks quickly put the plan together. Ultimately a deal was struck that would include Hugh Gantt as a partner in the proposed Bangs factory, sharing his expertise for 10% of the stock. Gantt would bring several of his key people down from Mayfield, assist in the design of the facility, and train the management and workers in the manufacturing process. He would also provide a market for the products, in the form of the Mar-Lita Lamp Company. Mar-Lita would purchase all of Texans output and serve as the final assembly arm of the operation. This partnership was what the fledgling company needed, as many of the problems facing start-up companies would already be resolved. The acquisition of capital proved to be a major, and ongoing, challenge. The investment required to build a modern manufacturing facility was substantial, and potential investors were reluctant to gamble on what seemed to be an extremely risky venture. This was to be the first large manufacturing company in Brown County, and a tremendous leap of faith was needed to believe it could be in Bangs. Lonnie Sikes, a successful insurance agent and realtor, put considerable effort into financing the project, but investors were difficult to find. Forrest Kyle and Tommy Young were instrumental in this task, and proved to be valuable promoters of the project. Tommy Young was particularly passionate in his drive to see the factory built, an enthusiasm that would be further displayed in the years ahead. Tommy played a key part in keeping things moving forward, selling his drugstore and literally putting everything he had into making it a reality. In a 2006 interview, Lonnie probably put it best, "If it hadn't been for Tommy Young there wouldn't have been any Texans Incorporated or Howard Kron. He was the pillar of the whole institution." After what seemed like a rough start, sufficient funds were raised, and in July of 1951 a new corporation, Texans Inc., was granted a charter with $100,000 of capital stock. The officers of Texans Inc. were Hugh Gantt, president, Lonnie Sikes, vice-president, and Tommy Young, secretary-treasurer. Sitting on the board of directors were Sikes, Young, Thomas Levisay, Oren Bauer, Raymond Morgan, Wylie McClatchey, W. Bryan Harriss (former major league player with the Athletics and Red Sox), Forrest Kyle, Gordon Griffin, Gus Rosenberg, and Hugh Gantt. The board designated Sikes, Morgan and Young to manage and supervise construction of the factory. Lonnie Sikes, whose businesses included insurance as well as real estate, played a significant part in the procurement of funds, often working behind the scene. Lonnie contacted his brother-in-law Novel Wylie of nearby Santa Anna, acquiring his services as constructing engineer at a tremendous savings. But even as the plan came to fruition, new obstacles threatened. Ten acres of land in southeast Bangs were selected and construction began, with much of the work being done by local volunteers. As construction progressed on the plant, additional expenses repeatedly surfaced, making additional funding a constant concern. Lonnie contacted banker friends in Fort Worth and Houston and secured loans to complete the construction, and the plant was finally completed for somewhere between $150,000 and $175,000. An open house celebration was held on March 12th, 1952 with over 3000 people in attendance. The event brought the community together, not just for a celebration, but in the knowledge that they were going to make a difference. The fully-operational factory was a sight to behold, with 25,000 square feet of workspace and an appraisal value of nearly $250,000. Visitors were impressed by the size of the operation, from the two 12 ton mixing tanks to the 30 ton slip tank. But the real show piece was the enormous 70 foot tunnel kiln, capable of producing 2,000 lamps per day. The facility was spectacular to be sure, but there was more to come. An adjacent building was already under construction, a 25x250 foot structure to house the Mar-Lita Lamp Company. Mar-Lita, named in part for Hugh Gantt's wife Carmelita, would be the assembly and sales branch of the new company, purchasing all of Texans production. A third building for lamp shade manufacture was in the planning stages, and a fourth for the manufacture of novelty tables was also being considered. While this multi-faceted approach gave Texans Inc. the power to manufacture and sell completed products, it soon proved to be the catalyst for serious internal conflict. The early stages were a learning process, with the charismatic Gantt and his men steering the course of the fledgling company. Several key individuals had moved their families from Mayfield to Bangs, all long-time employees at Polynesian Arts. Among those who relocated was Bob Hawn, who assumed the role of assistant superintendent and designer. Hawn had worked in the ceramics business from the age of fourteen, and was a highly skilled ceramics designer. Houston Carrico came on board as plant superintendent with five years experience at Polynesian Arts. G.B. Buchanan became the maintenance engineer, and was largely responsible for the design of the 70-foot tunnel kiln. British-born Reggie Turner would serve as the ceramics engineer. Involved in ceramics since 1934, Turner had received his training at Stoke-on-Trent Technical College, a school that catered specifically to the ceramics industry. The Staffordshire city of Stoke-on-Trent (also known as The Potteries) was a major center of pottery manufacture and the home of several important potteries, including Royal Doulton and Wedgwood. 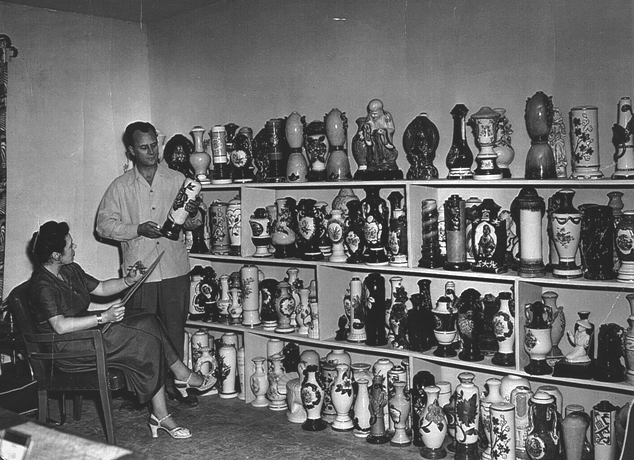 Turner came to the U.S. in 1947 and joined Polynesian Arts in 1949. Lonnie Sikes had built forty new homes to accommodate the workers and their families, all in close proximity to the new Gantt Street manufacturing facility. The transplanted workers from Polynesian Arts quickly brought the newly hired local employees up to speed, and the manufacturing/sales team of Texans Inc. and Mar-Lita fell into an efficient rhythm of operation. But within a years time a chord of discontent had been struck. The products coming out of Texans Inc. were primarily low cost, low profit items, not what Tommy Young had envisioned for the company. Young had quickly developed a keen knowledge of the ceramics business, and it was clear to him that higher profit items were necessary for a healthy bottom-line, but Gantt was not receptive to the notion of changing products. The disagreement culminated in a final confrontation between Young and Gantt, one that resulted in a severing of the relationship between Texans Inc. and Hugh Gantt. Speculation circulated that Texans was intended to fail, with the Mayfield parent taking possession and in turn transforming it to profitability. Conspiracy theories aside, there was clearly a power struggle between Young and Gantt, and its resolution was needed for Texans to grow. So less than a year after the initial agreement had been made, another was reached. Gantt would be bought out, and he and his workers returned to Mayfield.